Description: Ready made in a wide range of flavours, Lee Kum Kee Menu-orientated sauces bring you delicious dishes and save your time in the kitchen. Prepared from selected Lemon Concentrate and plum, this sauce is ideal for cooking Lemon Chicken or other lemon flavoured dishes. 150g / 5oz chicken meat (sliced), some corn starch, 1 pack Lee Kum Kee Sauce For Lemon Chicken (80g / 2.8oz). Serves 2-3. 1. Mix chicken with 1 tbsp beaten egg. 2. Dust chicken with corn starch. Pan-fry in 5 tbsp hot oil until golden yellow and done. Drain. 3. Heat 1 tbsp oil. Stir in Lee Kum Kee Sauce For Lemon Chicken and heat through. Add chicken and stir well lightly. Ingredients: Water, White Sugar, Corn Syrup Powder, Concentrated Lemon Juice (12%), Salted Plum, Rice Vinegar, Modified Corn Starch, Salt, Acid (E330), Natural Flavouring, Acidity Regulator (E331), Stabiliser (E415), Turmeric Powder. 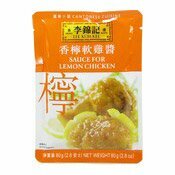 Simply enter your details below and we will send you an e-mail when “Sauce For Lemon Chicken (李錦記香檬軟雞醬)” is back in stock!